The new IsatPhone 2 is designed to operate even in the most extreme conditions: from searing heat to icy blast, desert sandstorm or monsoon rain. 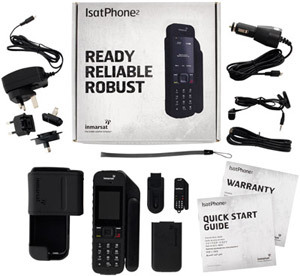 And with a faster network registration (under 45 seconds), an unrivalled battery life offering 8 hours talk time and 160 hours of standby time, users can always depend on the IsatPhone 2. It provides excellent voice clarity, call stability and an easy-to-use interface with large high visibility screen.